The mirrored room is no longer! WHOOOHOO!! 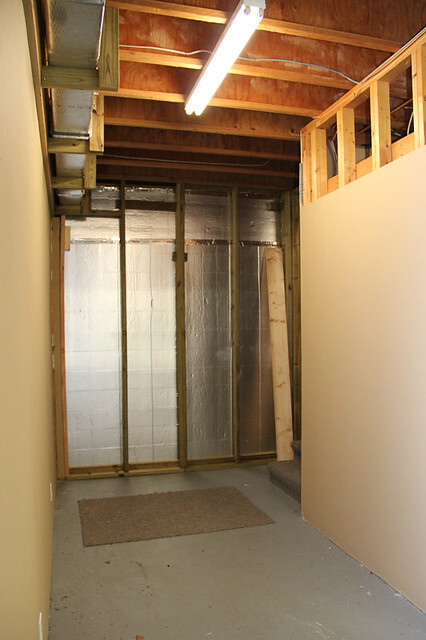 Since these two walls are completely underground, J applied rigid insulation board as a bit of a moisture barrier, then they built the frame for the wall studs in front of that. Outside the mirrored room is an alcove area that leads to the bathroom and has exit doors to the parking areas of the garage. 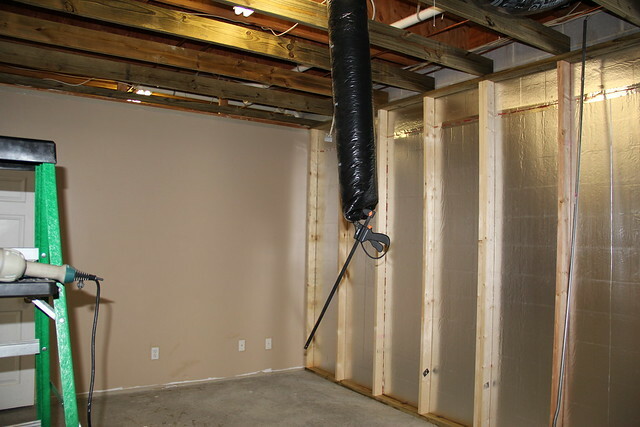 They had to work around the water heater and the air handler. J got the wooden cabinet to install into the wall as an access panel for knobs and spigot on the back of the water heater. It will make more sense once it’s installed. 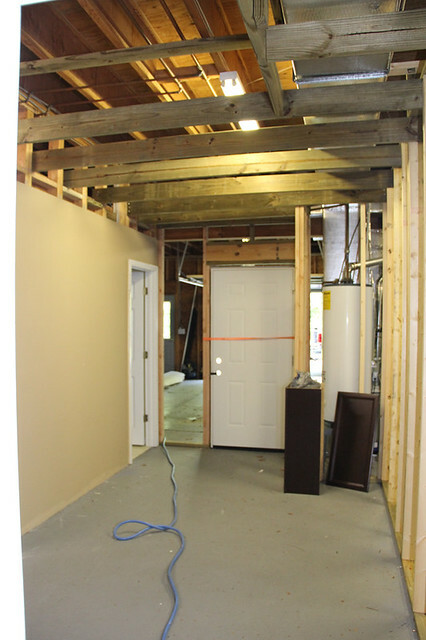 This little area is where the cabinetry will be installed. 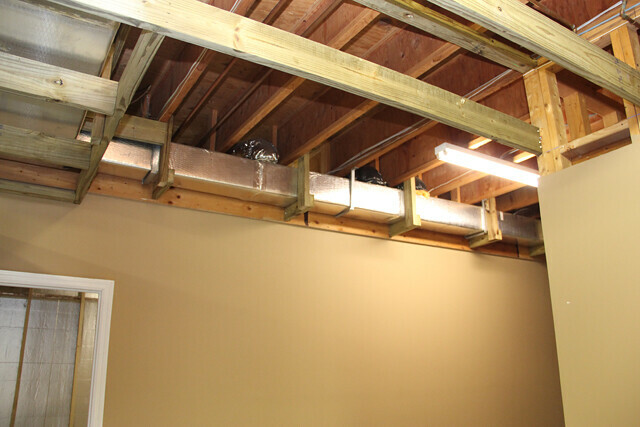 Because we wanted the ceiling height to be as high as possible, we had to get creative with the ceiling build-out. 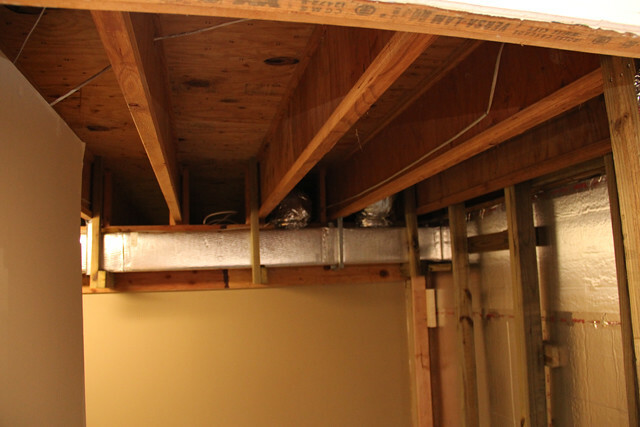 The ceilings will have a box beam around the ductwork that will accommodate the height differences in the room. It also helps keep the ceiling at the bottom of the staircase from being so low my 6’2″ husband won’t whack his head on it when he walks down the stairs. Very important things to consider in a tall household. 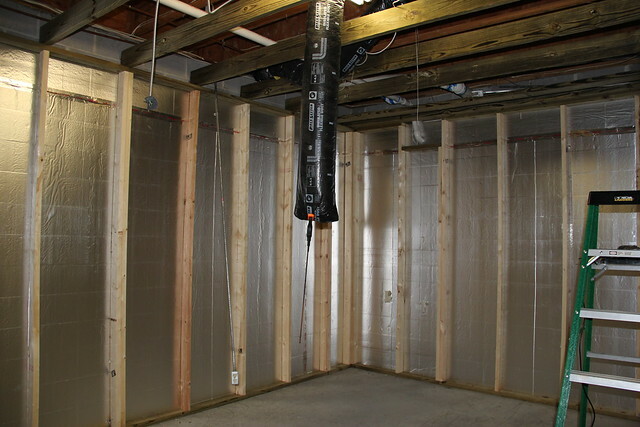 The center of the room will be 10′ high and drop down to 8′-6″ around the perimeter. J plans to trim out the ceilings with some crown molding and lighting. I can’t wait to see what he does with it. I’m excited to see how it turns out! So proud of my husband and my father-in-law for DIYing this huge job. They are really knocking it out of the park down there. Woah! Can you sen J my way next? 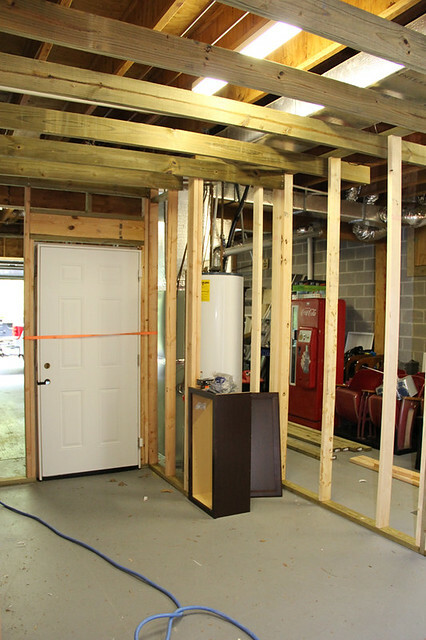 Glad you are progressing faster than we are on the basement so I can borrow some of your ideas! I can’t wait to see how it looks in the end!